I am very new to Go, and I found this tsumego, that I have been trying to figure out. 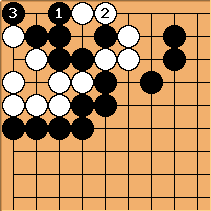 The solution is trying to live with a ko in the corner, but I think that it only brings death for Black. The solution makes sense to me if you are only trying to create the ko. I see the ko, and I see how it can move down into White territory. But it seems to me that if at B-19, it kills Black as it does not have a response that gains the Black stones any liberties, or is a ko threat. kills with D-18 (and leaves White with great eye shape). Am I missing something, did the originator miss something, or is the only object of the tsumego to get the ko? Normally, it is life or death, and the proposed solution for Black only leads to death as far as I can see. Bob McGuigan: It is not implied that there must be local ko threats. There might be moves elsewhere that are big enough so that White can't afford to ignore them. White only gains about 15 points by killing the black group and it might well be the case that two moves in a row someplace else could be worth more than 15 points for Black. So this problem is really about whether Black can create a ko situation that could, under the right circumstances, lead to life for his group. White cannot connect at A17 and if Black gets to play there then it is a different ko which is more favorable to Black. If Black wins this one all White's stones die.